aim your laser towards the flying disc and fire. Team Building and Events Management South Africa features Laser Clay Pigeon Shooting as an easy to learn team building event where participants can compete in teams against each other or to try and beat their own scores. Up to 5 people can shoot at a time and launches can be set at various speeds and angles to keep things interesting. All the team building participants shoot at one clay with a computer determining the order of hitting the clay. An indicator on the shotgun also gives instant feedback so that the participants can know when they had a hit. Spectators are able to follow the progress on the electronic scoreboard. 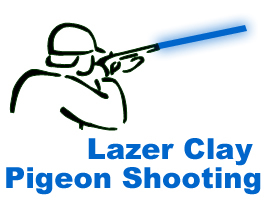 Laser Clay Pigeon Shooting is not harmful to the environment and guns fire harmless infrared beams at reusable clays. Realistic sound effects are computer generated with adjustable volume.